Amagi carrier sailing in 1944. Amagi “Heaven Castle” Japanese aircraft carrier was the last completed carrier of the Imperial Japanese Navy, and belonged to the Unryū-class aircraft carrier. In spite of being completed in a record time, she never embarked her air wings and spent the war in domestic Japanese home waters. After the battle of Midway a different Pacific War started for the Imperial Japanese Navy. They needed to replace the valuable carrier force lost in Midway and at the same time implement the learnt lessons during the war to improve carrier constructions and naval operations with aircrafts. The root of the new carrier design was the Hiryu carrier. Therefor, the Unryu-class directly evolved as an improved version of the IJN Hiryu design. The carrier Amagi was ordered as the order code #5001, as part of the Kai-Maru 5 Program of 1942. This program was very ambitious and planned the construction of 16 Unryu-class carriers. However, when the war ended only three were constructed, but still not operational. Amagi carrier air groups with A7M and C6N. Although she was supposed to embark the latest models of aircrafts, when she was commissioned in 1944, neither the A7M nor the C6Ns were yet in service, so the air group was reconfigured to consist of 27 Zeros, 12 D4Ys, three of which were to be the reconnaissance version, and nine Nakajima B6N “Jill” torpedo bombers. However, due to shortage of trained carrier aircraft pilots and crews, the air wings operated from land bases only. Construction and last days at Kure Naval Base. Amagi carrier was laid down in Nagasaki on 1 October 1942 by Mitsubishi manufacturer. The construction and design was strongly motivated by the Midway battle defeat. She was launched on 15 October 1943 and completed on 10 August 1944. She was therefore built in less than 2 years. Extremely high security measures were taken to avoid her being target of american bombers and carrier based aircrafts. This implied that Amagi carrier was transferred among a number of ports on the Inland Sea until she arrived in Kure in February 1945 and was ordered to be camouflaged. Her intended air group, Air Group 601, was committed to the Battle of Iwo Jima about that same time. Amagi was briefly refitted from 10 to 24 February. On 19 March, the ship was attacked by aircraft from Task Force 58 and lightly damaged by one bomb that struck the edge of the flight deck. 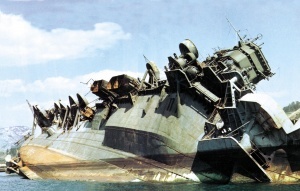 On 13 April, the ship was permanently moored at an island in Kure harbor and extensively camouflaged.In spite of all security measures, aircraft from Task Force 38 located her and succeeded in hitting bombs on July 1945. The ship capsized after being hit multiple times during airstrikes at Kure Naval Base. However, she was re-floated on 31 July 1946. The salvage job was conducted by the Hitachi Zosen facility in Kure and they scrapped the ship afterward. The works were finalized on 12 December 1947. Footage on the Amagi carrier wrecks in Kure port in 1946.